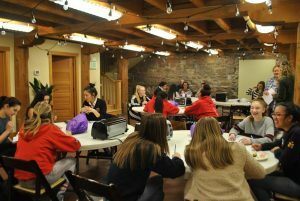 For our January edition of Taking Flight Nights, Salt Lake City’s Teen STEAM Café held a café about science in the culinary arts. 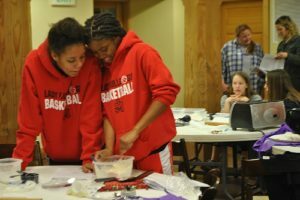 Dr. Robyn Hyde of Westminster College came to teach teens about the chemistry involved in baking! All living matter consist of chemicals. So, when baking delicious treats at home, combining ingredients creates a chemical reaction. Many don’t even realize that they are becoming chemists in their own kitchen. Dr. Hyde wanted to show us that while the word “chemical” is typically not thought of as something we want to ingest, everything we eat is actually a chemical and it’s all about the quantity in which we eat it! 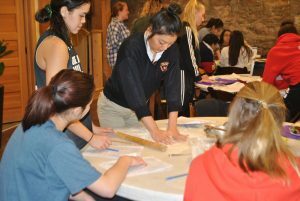 As groups, teens were asked to work through fun worksheets about the chemical reactions that happen when flour and water are mixed. Once we all had a better understanding how that works, it was time to try our hand as culinary chemists. For our hands on activity, we all got to bake our own biscuits! In our worksheets we had learned that different ingredient types, amounts, and the order in which you mix things can all result in different textures of biscuits. We were able to choose our ingredients using this information to see who could come up with the perfect biscuit. We got our hands dirty mixing flour and butter (which is harder than it looks!) 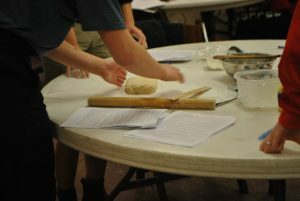 and folding dough in a tri-fold to create biscuit layers. We cut out our biscuits, placed them in a toaster oven and were able to watch them rise, or not rise, to see whose creations turned out well! In the end we ended up with a wide variety of biscuits, from giant fluffy ones to ones more resembling hockey pucks, but all tasted delicious with some butter and honey. This was a super fun café and we’re hoping to do more food science cafés in the future!